A building permit is issued directly to the builder and not the owner or designer. That means from the start of construction until the final certificate of occupancy, the area bounded by the property lines is the direct responsibility of the builder. These property lines are drawn from recorded legal descriptions onto survey maps and civil engineering documents and staked out in the field by licensed surveyors using instruments that precisely locate the corners that will orient the construction. These corners are calculated according to sight lines and tangents from permanent benchmarks in the area. 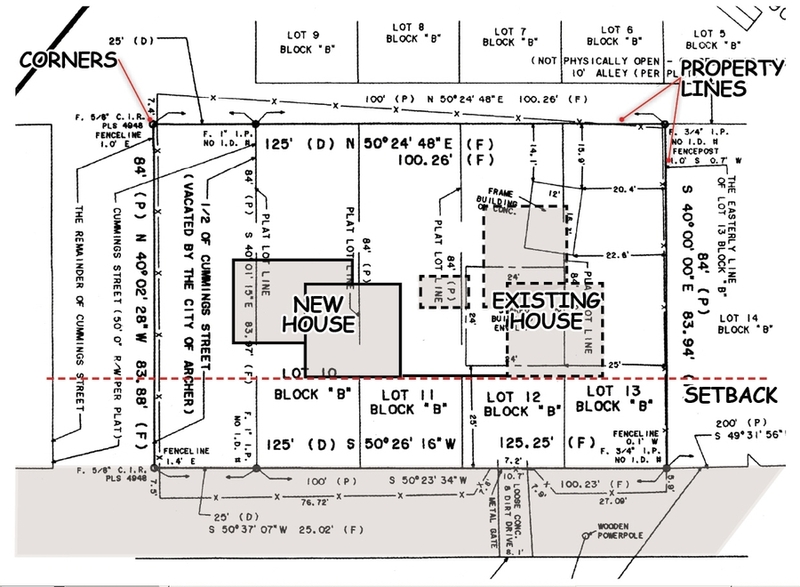 Staking the property corners is important because anything that happens during construction, along with any equipment, drainage, noise, smoke, dust, or debris that crosses the property boundaries is governed by neighboring property rights and local building codes. An experienced builder then starts construction by first meeting with neighbors and code officials to coordinate access points onto the site, staging areas for equipment, drainage and sediment controls for storm water erosion, and requirements for the protection of pedestrians and vehicular traffic during construction. 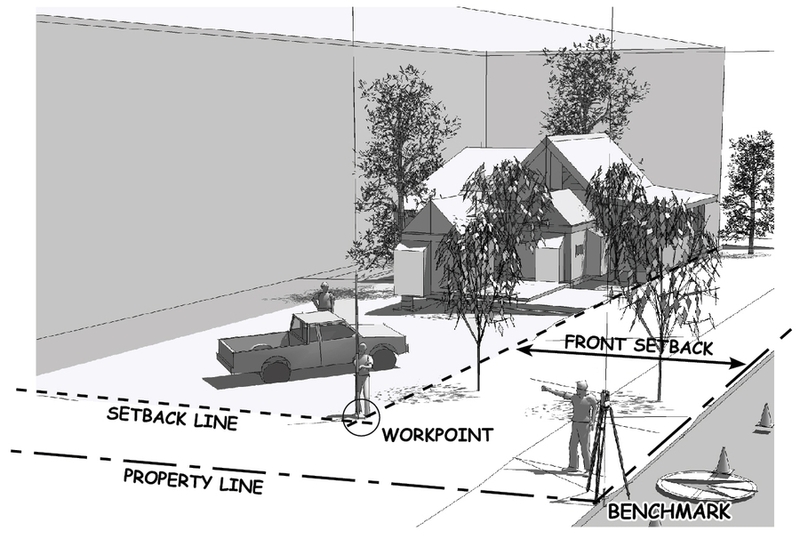 These preconstruction preparations are especially important when sidewalk and utility easements are within the property lines, and therefore part of the jobsite, because the builder is responsible for all private and public property damage and safety. 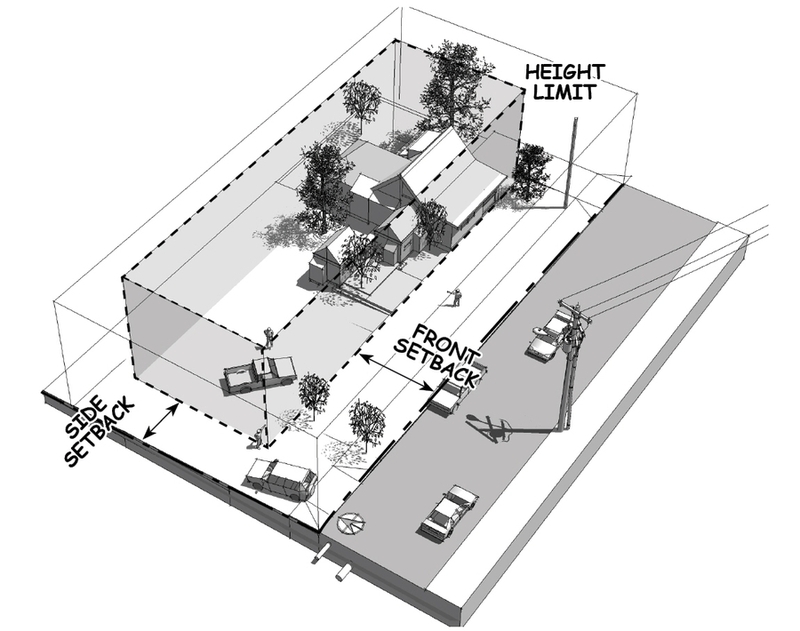 Height limits and setbacks from the property lines are set by the zoning codes that regulate land use. Even the slightest violation of height limits or misplacement into the setbacks will be cited as a code violation that could then trigger a stop work order, lengthy public review, and denial of a final certificate of occupancy for the completed building. 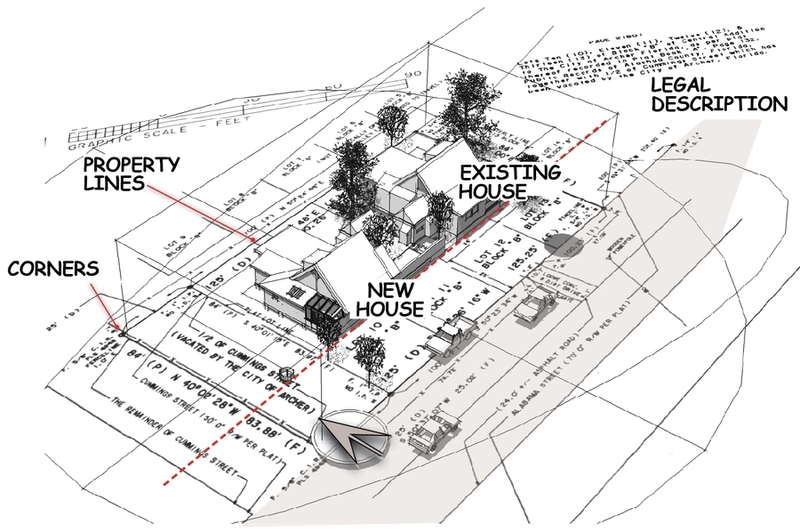 This means the completed building must fit within a three-dimensional box defined by the code. 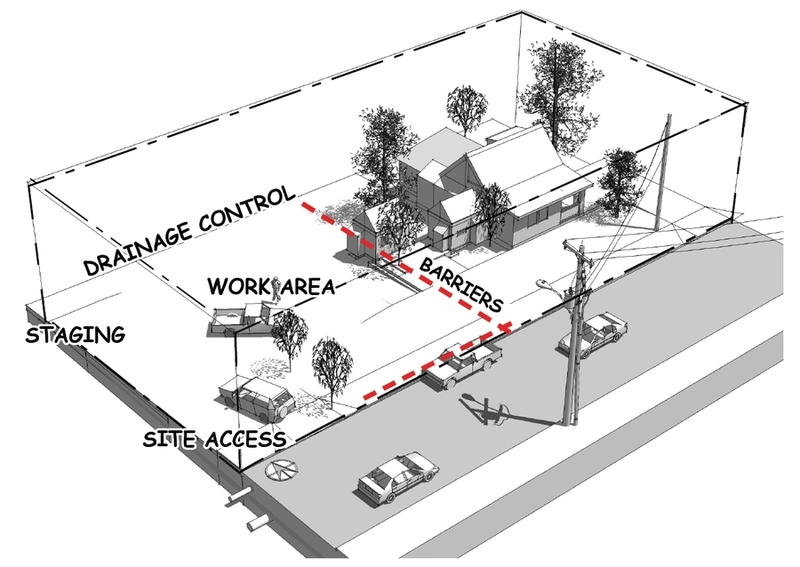 Liability for compliance makes it important that the setback lines, sea level elevations, and the footprint of the foundation be accurately located on the jobsite prior to construction. This includes the location and dimension of fence lines, driveways, curb cuts, roof overhangs, decks and stairs. 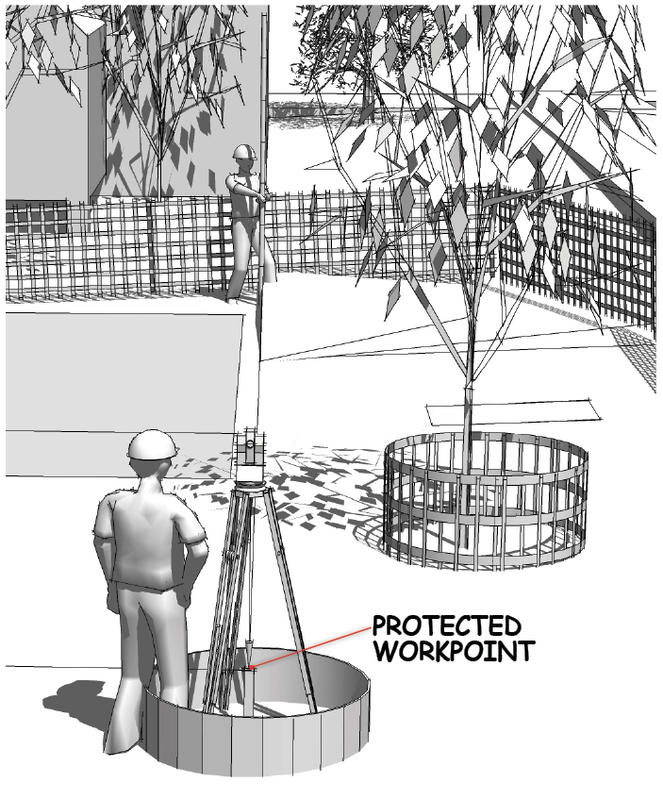 As a reference during the construction, a temporary workpoint is located somewhere on the jobsite. The workpoint is a three-dimensional point in space that is measured parallel to the earth’s latitude and longitudes, and vertically calculated according to sea level elevations determined by the surveyors. 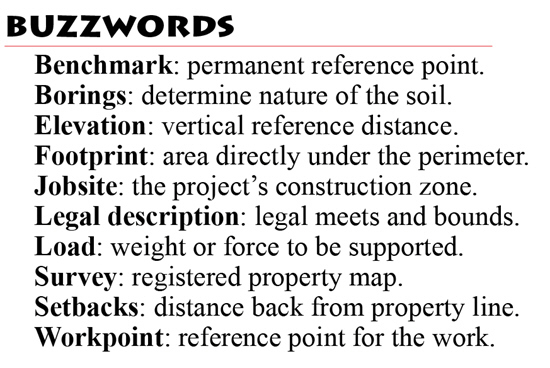 In this way, the workpoint is available as a reference for the depth of the excavation, corners of the foundation, height of the building’s frame, the location and elevations of roads and driveways, and all underground utilities. Builders also use the workpoint to locate borings to test and analyze the strength of the soil. These borings determine the type of soil and its bearing capacity in order to verify the size of the footings for buildings with special foundation requirements. Here then is an overview of the jobsite.